The vocoder was the last mold I needed to make. DONE! Everything is painted and weathered. It is less than perfect but I just had to keep telling myself 'the OT helmets are also hand painted and not symmetrical.' Still very proud nonetheless. Looks pretty impressive to me, nice work. I cut a notch off the arms and cut them into a better more accurate shape. This helped correct the mistakes I made. I also changed the ankles to be as tight as I could get them. You can see the one on the right is before and left is after. This was a big deal for me because it really bothered me how it looked. Now much more accurate. They started to crack a little so I will have to reinforce them eventually and paint again. 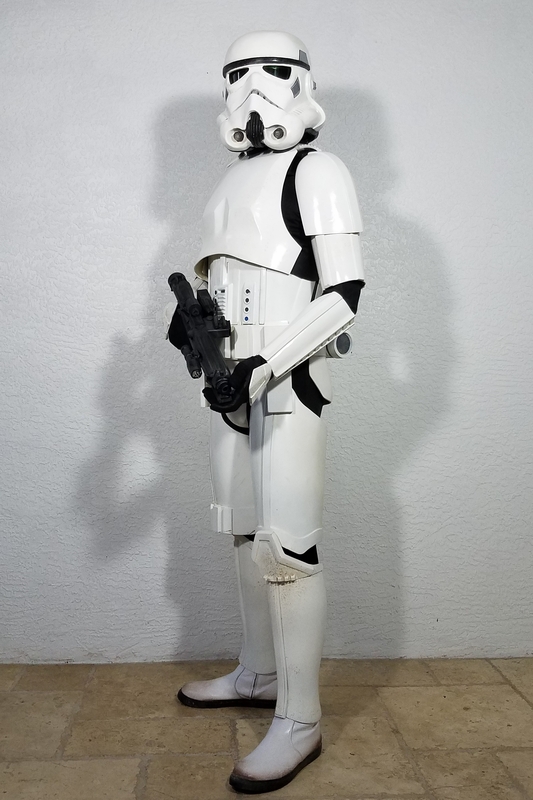 Hot Toys 1/6 scale figure or 501st approved costume? I am so happy with how this turned out. 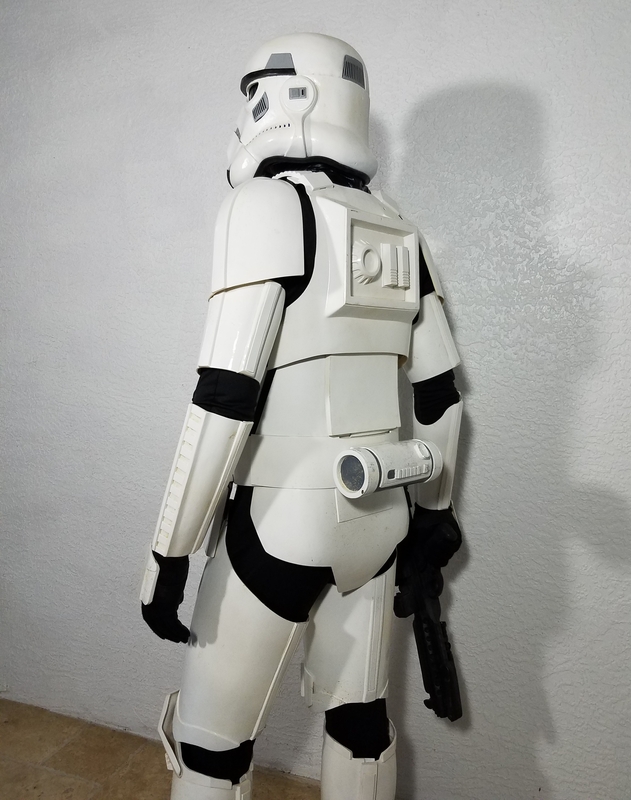 So much work has gone into this, and I still have a few things to change before I can go out trooping in it. Nice work, I would try to bring your chest inwards so it's sits a little flusher against the ab plate, it may come down a little which could help. I did look at that but many of the references photo I have show a large gab between the ab and chest plate. I do have my chest plate a hair too high though. I may try to fix that eventually. I'm also not a 100 percent on the under edge of my chest plate. You should be. 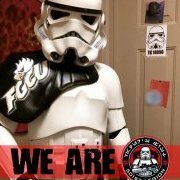 I look forward to trooping alongside you in your new TK! This little detail in Jimmy's kit just annoys me so much. It's the wrong shape on the shins. I don't know what to do about it. I considered trying to make my own but I'm just not crazy about going through that kind of trouble right now. 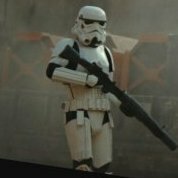 I know 850 armorworks is working on vacuum formed Rogue One armor and I'm hoping they have a better sculpt. Are you referring to the heavy contour? Yes, you see how it swoops inward dramatically at the ankle and then flares out at the boot. And it shouldn't have such a prominent calf. The curves just look wrong to me It should look more like the left photo and it bothers me. Copy. Jim's kits do have a tendency to have more curves to them but that's the personality of his fan sculpt. Does it negatively effect how the armor fits on you? Does it negatively effect how the armor fits on you? I suppose not but I think we need to be more accurate. I asked 850 armor works to send me some shoretrooper shins that I can hopefully mod to do the trick. Well 850s kits are considerably less detailed than Jim's (I've had both), not sure how this will resolve your issue if you're looking at it from an accuracy standpoint. Have you spoke with Jim to see if he's changed his process? Sorry, to clarify I've had both of their kits, not necessarily R1 TK. Have you spoke with Jim to see if he's changed his process? I wrote Jim about the issue just before I bought the kit. He said he would consider changing his molds when the ones he has are worn out. I haven't contacted him since so I dont know if he ever changed it. I do believe you that 850s details are softer and therefore less accurate but for what I'm doing it should be fine and from what I've see from photos the general shape seems to be more accurate. Also, the fact that 850 is made of ABS is a big bonus for the opening and closing of the shins. I'm considering buying a shoretrooper kit from 850, you just can't beat that price. I think you’ve done a wonderful job in your armor build. It renders well on you. That looks really amazing. Great source of inspiration. Quick question, how comfortable is the armor? Especially with walking through the sand and water! Looks wonderful. Quick question, how comfortable is the armor? Especially with walking through the sand and water! Looks wonderful. Its not bad. Because it's more fitted and made to look tighter it's a little more comfortable and less bulky than my Anovos. Not much but it has the slight edge on my Anovos armor. As far as walking through sand and water I didn't really notice a difference, but for the most part I can do stairs in both kits with no problem.